Whether you need commercial paper towels for your office kitchen or restroom, Scott Multifold Paper Towels are an excellent—and economical—choice. The packs of 250 (cases of 16 packs) contain commercial paper towels with signature Absorbency Pockets that absorb a lot of water fast, for superior hand drying. They’re designed to reduce waste in your office or business, since they fit into any universal dispenser for trifold paper towels or multifold towels (which helps control over use). 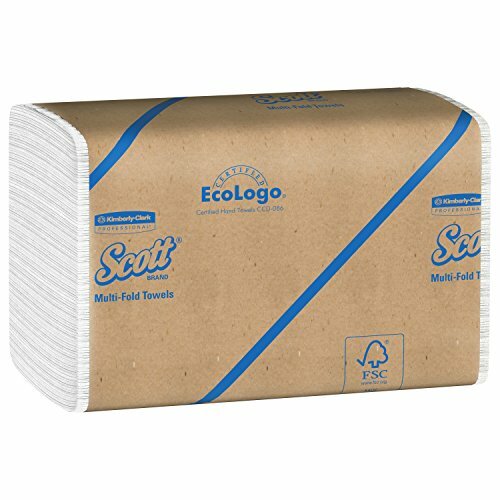 Made with 40% post-consumer waste and 60% recycled fiber content, Scott folded paper towels meet EPA standards and are FSC and Eco Logo certified, you know they’re great choice. With Kimberly-Clark Professional’s Scott brand products, you can get the quality and performance you count on – and still stay within your budget. In fact, these products can actually help you reduce maintenance time and costs with innovations like touchless, high-capacity systems. Scott Brand is known for consistent quality at an affordable price. If practicality and value top your criteria for business washroom products, trust Scott brand to deliver.